Oh to be a bird, flying high in the sky, defying gravity. But all is not so simple for smaller birds. Predators are waiting at every turn so some birds have a way of trying to confuse the predators. They fly in large flocks, twisting and turning through the sky to form amazing patterns. Here in the UK starlings perform this ritual before settling down for the night on their roosting spots. 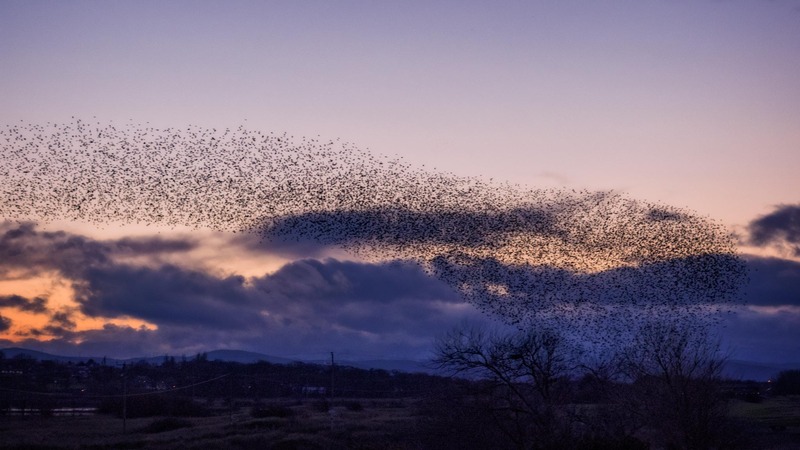 Grouping together offers safety in numbers – predators such as peregrine falcons find it hard to target one bird in the middle of a hypnotising flock of thousands. The only way to see this is to get out there, into the open countryside. That’s where the birds are. You’ve got to go to them. Last night was cold but worth it. The starlings started flying about dusk 4.00pm. Just a few birds at first, but gradually the flock got bigger and bigger as more starlings joined the murmuration. 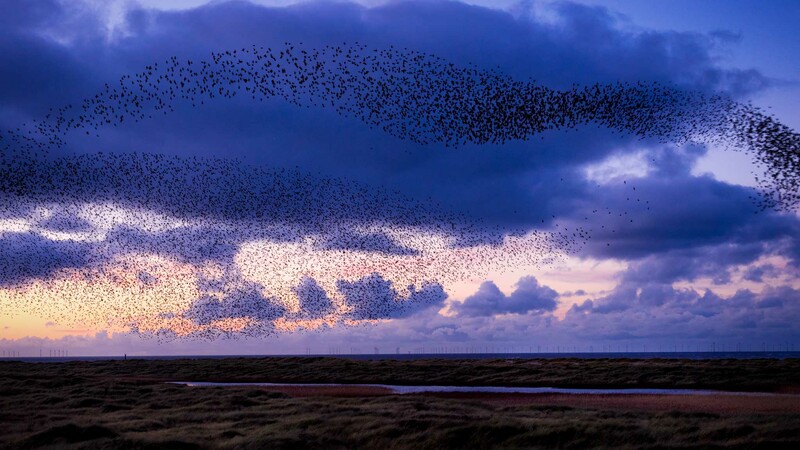 That’s what it’s called, a murmuration, at least here in the UK it is. Have you ever seen birds flying like this. What do you call it? The display continued until about 4:35. Then suddenly it was all over. They just disappeared. Where had they gone? Simple really, they settle for the night on the wetlands where they roost. Here they’ll stick together and keep warm overnight. Oh! And according to the RSPB, this is where they swop stories about the best feeding areas. Here’s what other bloggers are saying about this week challenge. Thank you Norma. A little bird, excuse the pun, told me about this happening every night. It’s only about ten minutes drive from me so nice and easy to get to. Unfortunately it’s out on the wetlands, right next to the sea. so if the wind is blowing it sure is cold. Something else I learned. Take an umbrella. If they fly right over you, as they did several times last night, it can get rather messy. Mike I agree with you that setting up stuff for photography is no fun..being able to capture in natural environment with best possible resources is true essence of photography! Nice capture for the theme, Mike! Thank you. I don’t often do bird photography but this was too good an opportunity to miss. Wonderful captures, Mike. Murmurations are fascinating to watch. Makes you wonder how they decide who the head choreographer is going to be for their performance. As I watched them the other day Chuck I thought the same thing. Who decides which way to turn. Sometimes though they’d get it wrong and the group would split but they would soon come together again. Amazing. Absoutely fantastic photographs! Wonderful framing that captures both the action and landscape well! So that’s where all the local starlings gather now! There was a lovely roost on the Old Colwyn pier, with the birds putting on a regular evening display, but they departed when they started work on the ‘new’ beach and haven’t returned. Great images. I didn’t realise they were Theresa. It was only a chance remark by someone that I overheard in the supermarket.